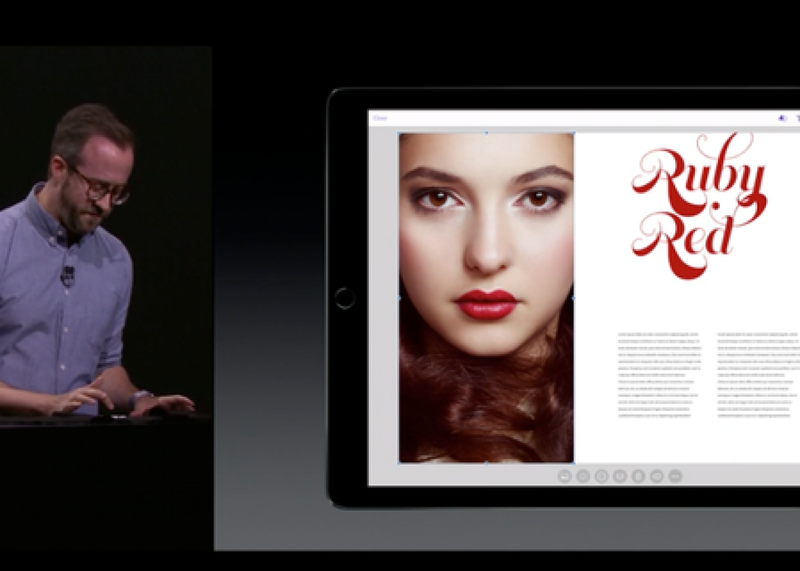 Apple event: Adobe manipulates a photo of a woman to make her smile. Adobe to Women at Apple Event: Would It Kill You to Smile? This little lady looks pretty glum. Not for long! Women hear it on the sidewalk, in the checkout line, and from Internet trolls. Now, they’re hearing it at a fancy tech summit from the creators of watches that talk and telephones that play music. If any women hoped they could at least get through Wednesday’s Apple event without being told to smile, they were in for a sadface. During Adobe’s demonstration of its new image-editing tools for the iPad Pro, the onstage representative played out a scenario with a photo of a woman who, he said, wasn’t smiley enough. Lucky him: On his tablet, if not in real life, he can manipulate her face to his exact liking. Critics of Apple’s reliably male speaker lineups have counted the number of women ever to appear on the tech company’s stage; before this year, they hadn’t made it to two hands. In response to questions about Apple’s gender diversity before Apple’s annual developer conference, Tim Cook turned smug: “Look tomorrow,” he told Mashable. “Look tomorrow and let me know what you think.” Sure enough, two women addressed the conference the next day—and Wednesday’s event brought three more onstage. Unfortunately for Apple, putting the right bodies on a stage won’t do much to allay accusations of sexism if women aren’t making decisions backstage, too. Watching the Adobe demonstrator make his subject grin would likely induce flashbacks in any woman who’s ever been asked by a stranger to contort her face into a shape that better pleases the men who have to look at her. The next time Adobe wants to show off its latest apps on a photo of a woman, it’d be better off giving her a set of bloody fangs instead. Incidentally, when I checked in with Apple’s lead female, Siri, about her facial expression, she bristled. “Will you smile?” I asked, polite as ever. “This is about you, not me,” she replied. Come on sweetheart, lighten up that screen!